The Kansas City law office of Lewis Rice announced today that Bill Carr will be stepping down as Managing Member and will be succeeded by Tom Martin. "I am gratified that over the years we have remained true to the high standards of competence, character and integrity set by our Kansas City founders," Carr said. "Now the time has come to retire from management. It is vital to the health of the Firm to allow others to assume the mantle of leadership - those with fresh ideas to navigate today's highly competitive legal business." The Kansas City members unanimously elected Tom Martin as Carr's successor. Martin has been an integral part of the Firm's Litigation Department for almost three decades. His practice focuses on banking and commercial litigation. During the past few years, Martin has also chaired the marketing committee. Martin received his Jurist Doctorate and Master of Business Administration from the University of Kansas in 1988. 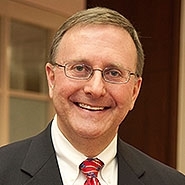 He received his Bachelors of Business Administration from Washburn University in 1984, where he specialized in a dual course work of economics and finance. "This is a great opportunity and I am excited to serve the Firm in this new capacity," Martin said. "It is my intention to build upon the strong foundation that Bill has helped establish and continue to provide the best possible legal services to our clients." Carr will continue to practice law with the Firm but is planning to spend more time with his children and grandchildren. "Through Bill's many years of steady leadership this Firm remained true to its culture, a great and rewarding place to work professionally, but with a sense of family for all our attorneys and support staff," said Stan Johnston, Business, Tax and Estate Planning Department Chair. "Bill has shown the true meaning of being a leader, which is to be of service to the greater good of our organization. While he will be missed in his management role, he will continue to be a resource, both as an unparalleled practicing lawyer, and as a mentor to those of us that remain in the management of the Firm."